Conducting is the act of directing a musical performance by way of visible gestures. 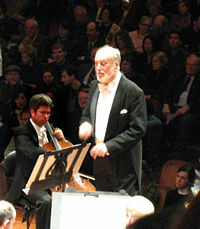 Orchestras, choirs, concert bands, and other musical ensembles often have conductors. Beyond the gestural aspect of the art form, other significant aspects of conducting include scholarship, score reading ability, and having a trained musical ear. A strong foundation in composing, music theory, and orchestration is particularly important. The conductor's task is, simply put, to bring a sense of unity to a given piece of music. In the conductor-orchestra relationship, the conductor stands in the position of musical authority. Through the use of gestures (baton technique) the conductor provides the tempo (tactus) and a beat (ictus) that allow the members of the ensemble to establish the proper timing to present a given composition. The conductor is also the final arbiter of issues such as phrasing, dynamics (loud or soft), and articulation—components that contribute to creating a unified realization of the music being performed. 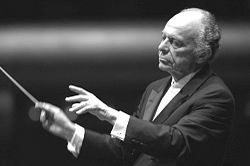 The principal conductor of an orchestra or opera company is sometimes referred to as a music director or chief conductor, or by the German word, Kapellmeister. Conductors of choirs are sometimes referred to as choral director, chorus master, or choirmaster, particularly for choirs associated with an orchestra. Conductors of military bands and other bands may hold the title of bandmaster. Respected senior conductors are sometimes referred to by the Italian word, maestro ("master"). In the seventeenth century, other devices to indicate the passing of time came into use. Rolled up sheets of paper, smaller sticks, and unadorned hands are all shown in pictures from this period. The large staff was reportedly responsible for the death of Jean-Baptiste Lully (1632-1687), who stabbed his foot with one while conducting a Te Deum for King Louis XIV's recovery from illness. Lully died from a resulting infection. In instrumental music of the Baroque era, a member of the ensemble usually acted as the conductor by providing a discernible beat. This was sometimes the principal violinist, who could use his bow as a baton, or a lutenist who would move the neck of his instrument in time with the beat. It was common to conduct from the harpsichord in pieces that had a basso continuo part. In opera performances, there were sometimes two conductors: the keyboard player was in charge of the singers, and the principal violinist was in charge of the orchestra. By the early nineteenth century, it became the norm to have a dedicated conductor, who did not also play an instrument during the performance. The size of the usual orchestra expanded during this period, and the use of a baton became more common, as it was easier to see than bare hands or rolled-up paper. This practice provided a silent way to indicate tempo (tactus) and beat (ictus). The first conductors to utilize a baton can be traced back as early as 1794, when a Belgian composer, Guilliame-Alexis Paris (1740-1850) used a baton while conducting opera in Hamburg, Germany. Among the earliest notable conductors were Louis Spohr (1784-1859), Carl Maria von Weber (1786-1826), Louis Antoine Jullien (1812-1860), and Felix Mendelssohn (1809-1847), all of whom were also composers. Spohr is also credited with introducing rehearsal letters or bar numbers into scores and parts as a way to facilitate more efficient rehearsal time. Among prominent conductors who did not or do not use a baton are Leopold Stokowski, Pierre Boulez, Dimitri Mitropoulos, and Kurt Masur. Hans von Bülow is commonly considered the first professional musician whose principal career was as a conductor. Composers Hector Berlioz (1803-1869) and Richard Wagner (1813-1883) were also conductors, and they wrote two of the earliest essays dedicated to the subject. Berlioz is considered the first virtuoso conductor. Wagner was largely responsible for shaping the conductor's role as one who imposes his own view of a piece onto the performance (interpretation) rather than one who is simply responsible for ensuring entries are made at the right time and that there is a unified beat. 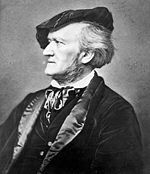 Richard Wagner wrote extensively about the art of conducting and perhaps more than any musical figure of the nineteenth century was responsible for developing the attitude that the conductor was a supreme figure whose wisdom and musical prowess were unquestioned. Wagner's influence, especially with regard to the interpretive aspect of conducting, can still be observed in modern times. For Wagner, the modification of tempo as it relates to phrasing, was of supreme importance. Prior to Wagner, the conductor's task was primarily to beat and adhere strictly to the metronomic designations in a given score. This produced a conducting style that lacked flexibility or a more nuanced expressiveness. Wagner emphasized the idea of melos (or song), in which tempos could be adjusted, faster or slower, to give a different contour to a particular phrase in the same fashion that singers might use rubato (from the Italian for "stealing time") for expressive effect. For Wagner, tempo modification was nothing less than "a positive life principle in all our music." This was akin to Beethoven's idea of "elastic tempo" whereby the liberal use of rubato was used as an expressive device. Conductors who eschewed the Wagner influence as it pertained to tempo gradation and modification, and took a more literal approach, include Arturo Toscanini (1867-1957), George Szell (1897-1970) and Roger Norrington (b. 1934). Norrington is an especially noted advocate of strict adherence to the metronomic designations. In the late twentieth century, a New York composer Walter Thompson created a live composing sign language known as soundpainting to be used in the medium of structured improvisation. At present the language includes over 750 gestures used as communication tools by the composer/conductor to indicate the type of improvisation desired of the performers. In addition, a system called conduction, developed by Lawrence D. "Butch" Morris, is another prominent movement in the field. The latter is considered more effective to dictate relationships and transformations, giving the improvisers more control over the content they contribute. 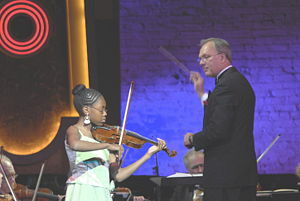 Conducting is a means of communicating artistic directions to performers during a performance. There are no absolute rules on how to conduct correctly, and a wide variety of different conducting styles exist. The primary responsibilities of the conductor are to set the tempo, execute clear preparations and beats, and to listen critically and shape the sound of the ensemble. An understanding of the basic elements of musical expression (tempo, dynamics, articulation) and the ability to communicate them effectively to an ensemble is necessary in order to conduct. The ability to communicate nuances of phrasing and expression through gesture is also beneficial. Conducting gestures may be choreographed beforehand by the conductor while studying the score, or may be spontaneous. Hungarian conductor George Szell once remarked, "People often refer to the sound of a particular orchestra. But how many people, even the educated layman, refer to phrasing and articulation, these being the key elements in realizing the proper understanding of the music being performed?" A distinction is sometimes made between orchestral conducting and choral conducting. 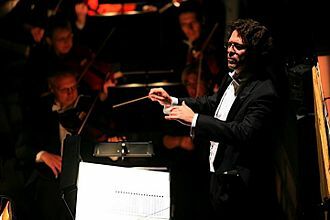 Stereotypically, orchestral conductors use a baton more often than choral conductors (though not always: this is up to the conductor's personal preference), and favor the use of beat patterns over gestural conducting, which concentrates more on musical expression and shape. The grip of the baton varies from conductor to conductor. Despite a wide variety of styles, a number of standard conventions have developed. The beat of the music is typically indicated with the conductor's right hand, with or without a baton. The hand traces a shape in the air in every bar (measure) depending on the time signature, indicating each beat with a change from downward to upward motion. The images to the right show the most common beat patterns, as seen from the conductor's point of view. Changes to the tempo are indicated by changing the speed of the beat. To carry out and to control a rallentando, a conductor may introduce beat subdivisions. The downbeat indicates the first beat of the bar, and the upbeat indicates the last beat of the bar. The instant at which the beat occurs is called the ictus (plural: ictus or ictuses), and is usually indicated by a sudden (though not necessarily large) click of the wrist or change in baton direction. In some instances, "ictus" is also used to refer to a horizontal plane in which all the ictuses are physically located, such as the top of a music stand where a baton is tapped at each ictus. The gesture leading up to the ictus is called the "preparation," and the continuous flow of steady beats is called the "takt." If the tempo is slow or slowing, or if the time signature is compound, a conductor will sometimes indicate "subdivisions" of the beats. The conductor can do this by adding a smaller movement in the same direction as the movement for the beat to which it belongs. Some conductors use both hands to indicate the beat, with the left hand mirroring the right, though others view this as redundant and therefore to be avoided. This is also seen as improper practice by many. The second hand may be used for cueing the entrances of individual players or sections, and to aid indications of dynamics, phrasing, expression, and other elements. Dynamics are indicated in various ways. The dynamic may be communicated by the size of the conducting movements, larger shapes representing louder sounds. Changes in dynamic may be signaled with the hand that is not being used to indicate the beat: an upward motion (usually palm-up) indicates a crescendo; a downward motion (usually palm-down) indicates a diminuendo. Changing the size of conducting movements may result in unintended tempo changes because larger movements require the beat to traverse more space in the same amount of time. Dynamics can be fine-tuned using various gestures: showing one's palm to the performers or leaning away from them may demonstrate a decrease in volume. In order to adjust the overall balance of the various instruments or voices, these signals can be combined or directed towards a particular section or performer. The indication of entries, when a performer or section should begin playing (perhaps after a long period of silence), is called "cueing." A cue must forecast with certainty the exact moment of the coming ictus, so that all the players or singers affected by the cue can begin playing simultaneously. Cueing is achieved by engaging the players before their entry and executing a clear preparation, often directed towards the specific players. Mere eye contact or a look in the general direction of the players may be sufficient in many instances, as when more than one section of the ensemble enters at the same time. Larger musical events may warrant the use of a larger or more emphatic cue designed to encourage emotion and energy. An inhalation, which may or may not be a semi-audible "sniff" from the conductor, is a common element in the cueing technique of many conductors. Articulation may be indicated by the character of the ictus, ranging from short and sharp for staccato, to long and fluid for legato. Many conductors change the tension of the hands: strained muscles and rigid movements may correspond to marcato, while relaxed hands and soft movements may correspond to legato or espressivo. Phrasing may be indicated by wide overhead arcs or by a smooth hand motion either forwards or side-to-side. A held note is often indicated by a hand held flat with palm up. The end of a note, called a "cutoff" or "release," may be indicated by a circular motion, the closing of the palm, or the pinching of finger and thumb. A release is usually preceded by a preparation and concluded with a complete stillness. Conductors aim to maintain eye contact with the ensemble as much as possible, encouraging eye contact in return and thus increasing the dialog between players/singers and conductor. Facial expressions may also be important to demonstrate the character of the music or to encourage the players. With the emergence of the modern conductor in the twentieth century, there were a number of important conductors who established long-term relationships with ensembles and in so doing brought a distinctive sound and style to their orchestras. Among the most prominent of these conductor/orchestra relationships were Herbert von Karajan (1908-1990) with the Berlin Philharmonic, Eugene Mravinsky (1903-1988) with the Leningrad Symphony Orchestra, George Szell (1897-1970) with the Cleveland Orchestra, Eugene Ormandy (1899-1985) and Leopold Stokowski (1882-1977) with the Philadelphia Orchestra, Fritz Reiner (1888-1963), and Georg Solti (1912-1997) with the Chicago Symphony Orchestra. The dynamic of the symphonic tradition as it pertains to the relationship between the modern conductor and orchestra, has been articulated in a most poetic fashion by long-time program annotator of the Cleveland Orchestra, Klaus George Roy, when he wrote: "What more miraculous creation of mankind is there than the symphony orchestra—a hundred musicians collaborating flawlessly in the creation of a single sonority from moment to moment, under the guidance of a single and singular mind who conveys the sound image of another's tonal imagination, and carrying with it a single listener as it carries a thousand or two thousand? We tend to take for granted the skill and sensitivity of such a performing organism, and we should take time to marvel afresh that such a joint effort is possible for human beings, so rich in communication, beauty and meaning." This page was last modified on 17 March 2017, at 15:37.